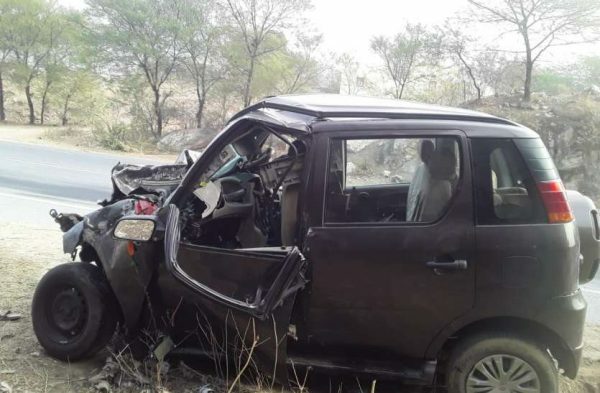 Udaipur : Four persons who were returning from the stone mart exhibition at Jaipur, were killed in a road accident near Kitela village between the Gomti-Beawar section on the NH-8. The victims were marble businessmen who lived in Dhoinda and Kankroli of Rajsamand districts. Three of them originally hailed from Kerala, police said. Suresh Kumar (55) so Chellapan Pillai, Anil Kumar Raghavan (32) Vinay Shekhar so ChandraShekhar Pillai (46) and Rameshchandra so Bhanwarlal Kumawat were travelling from Jaipur to Rajsamand in an SUV. Their vehicle collided with a truck approaching from the opposite side. According to police, the collision took place due to wrong overtaking by the truck driver who overtook a private bus and in the course hit the car in which the victims were travelling. The impact of the collision was so terrific that the car was completely damaged and passengers were stuck inside badly. Traffic on both directions ground to a halt for hours. Police team from Charbhuja station arrived and pulled out the victims who were rushed to nearby hospital, however all of them had died by then. Police has seized both the vehicles and registered a case against unidentified driver who had fled from the spot after the accident.